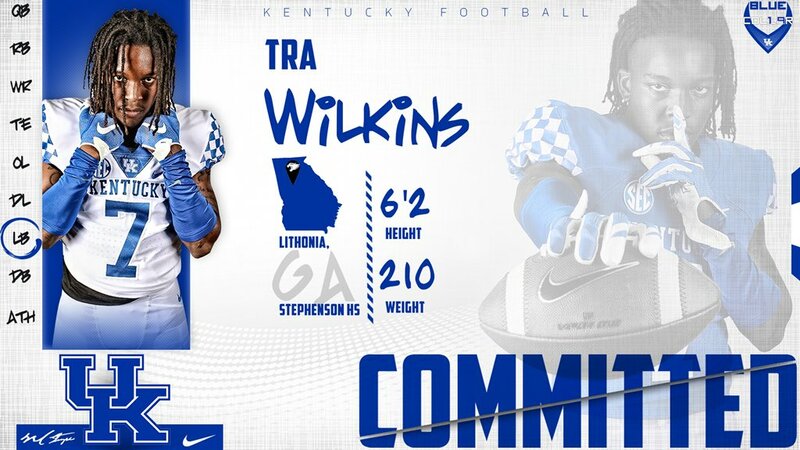 Back in June, Kentucky received a commitment from 2019 three-star linebacker Tra Wilkins. Wilkins, a 6-foot-2, 210-pound outside linebacker out of Lithonia, GA chose the Cats over Louisville, Alabama, Auburn, Florida, Ohio State, and Georgia, among other major programs. Now, his high school game is being broadcast LIVE on YouTube, where his Stephenson High School team is taking on Southwest DeKalb High School. Wilkins recorded 75 tackles, five sacks, and three forced fumbles as a junior. How is he doing? He must be something due to the fact I think that is the best offer sheet I have ever seen for a UK commit!? If there was or is a better one please show me. I mean Bama,OSU,UGA,AU! Wow only seen 1 turd offer for him .. Here is the pregame talk, looks like a Stephenson win for sure. Oh wait, DeKalb won. Guess more NCAA coaches should be looking at their players. The Stephenson Jaguars meet DeKalb County rival Southwest DeKalb in Week 2 of the GHSA Football season. Stephenson is led by 3-star OLB Tra Wilkins (Kentucky), 3-star WR Deshon Stoudemire (West Virginia), OT Joshua Black (Georgia Tech), 4-star CB Javier Morton (Alabama), 4-star DT Nazir Stackhouse (UGA), 3-star RB Deondre Jackson, 2-star WR Donnovan Moorer and 2-star RB Miles Friday. Southwest DeKalb features 3-star ATH Jamel Starks.